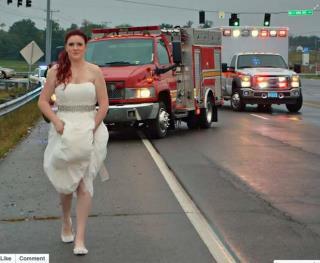 (Newser) – A post-wedding car crash, a concerned bride, and her photographer mom all came together in Tennessee to create a picture you won't see in too many wedding albums: a woman in her wedding dress helping out at the scene of an accident. The now-viral photo—posted on the Montgomery County Facebook page and already boasting more than 12,800 likes and 5,600 shares—shows paramedic Sarah Ray on her Oct. 3 wedding day, hiking up her wedding dress on the side of the road in Clarksville with emergency vehicles behind her. She received a call right before her reception that her dad and grandparents got into an accident en route to the party. "The car was totaled, that's all we knew," she tells the Leaf-Chronicle. No one was seriously injured, and her mom, also on the scene, captured this photo as Ray made her way back to her vehicle. People turning their good intentions into actions -- this is the glue which holds us together. People seeing each other as prey -- this is what will destroy us. I hope the former, wins out over the latter.